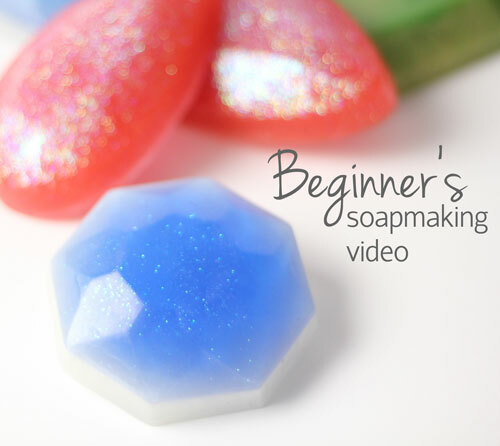 In this episode of Soap Queen TV, I get back to the basics of soap making. Melt & pour soap is the perfect place to start if you are just learning to make your own bath and beauty products. It’s safe, easy and very forgiving; if you make a mistake, just melt the soap and try again. Using the Three Gems Mold to create three different soap, this episode covers embedding, layers and swirling in melt and pour. Want to dive even further into melt and pour techniques? The Basics of Melt and Pour Series has you covered! Hey! Im a beginner in making soap. But please kindly send me such procedure that could make my guide in doing a soap without a lye. Thanks. I love making melt and pour soap but I continue to have problems keeping the scent in the bars. I have doubled the amount of essential oils, replicated other recipes and still after as short as one week the beautiful scent is gone. What am I doing wrong or is this one of the downfalls of M&P soap making? Melt and pour soap can definitely hold scent. What type of essential oils are you using? Typically, citrus essential oils – except 10x Orange Essential Oil – tend to fade. Also, how much are you using? So pretty! I especially enjoyed the swirling technique since that is something that I really need to work on. Thank you for this nice refresher on M&P. I do mostly CP NOW, BUT MY 10 year old daughter is taking up M&P. She loves it! She’s already selling her soaps, and learning to put money aside for supplies. She watches all your videos, so she’ll love this new one!! Just so I’m sure, are you wanting to add extra oils to your cold process or melt and pour soap? Adding extra oils to melt and pour can be trickier. Because the bases have already turned into soap, adding more oils can make it greasy, crumbly or oily. If you do add extra oils, I’d recommend starting out at about 1 tsp. per pound.